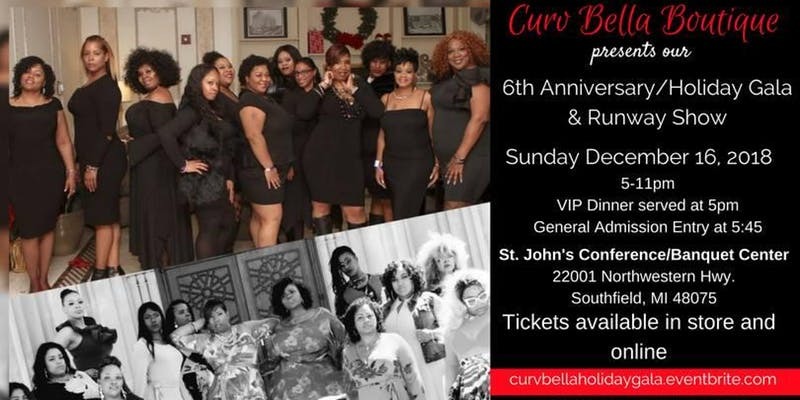 Curv Bella is gearing up for their 6th Anniversary/Holiday Gala on December 16, 2018 from 5:00 p.m. – 11:00 p.m. The event will feature some of Detroit’s hottest Curvy Models. Curv Bella has been serving and giving women the confidence to embrace their curves, beauty, uplifting and inspiring women of all sizes that beauty comes in all shapes and sizes. The event will entail a fashion show, networking and dinner for dinner for VIPs. Doors open at 5:00 p.m., the show will begin promptly at 6:00 p.m.
Tickets range from $30 – $60 and can be purchased here. Disclosure – This is a sponsored post and may contain affiliate links. By clicking and shopping, you help support Detroit Fashion News and allow us to keep reporting on all things fashionable.